Barnett Fine Art has recently received an exciting new consignment! 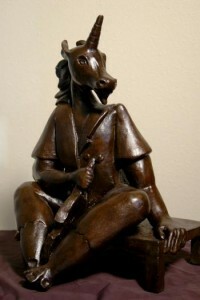 Now available is the Alexandra Nechita sculpture The Unicorn. Learn more about the sculpture, as well additional works of Nechita’s available through Barnett Fine Art, below. As a child prodigy, Nechita had been dubbed “The Little Picasso” for her early paintings that were heavily influenced by Picasso’s Cubist style. As her career progressed, she adapted her instantly recognizable style to a number of mediums. She began sculpting in the early 2000’s using glass as a medium, and quickly branched out to other mediums including bronze and other metals. Barnett Fine Art has a number of Nechita sculptures, available in a wide range of sizes and mediums. A number of them are part of a sold out edition. For a full list of Nechita’s works available through Barnett Fine Art, please click here to find original paintings, etchings, and more, including the coveted Dreamination II collection. The now 29-year-old Nechita was born in 1985 in Romania. She moved to California with her family in 1987, where she took up an immediate interest in drawing. Her parents nurtured this interest, and by the age of 8, she gave her first solo exhibition at a public library in Los Angeles County. That same year, 1994, she saw her first Picasso exhibit at the Los Angeles County Museum of Art. In 1995, a CBS producer took notice of Nechita’s work at the Mary Paxon Gallery, which led to her appearance on CBS Sunday Morning. The rest, as they say, is history. Nechita has collected a number of accolades over the course of her career. Among others, she was selected by the World Federation of United Nations Associations to lead a Global Arts Initiative involving more than 100 nations in 1999. In 2005, her United Nations Peace Monument for Asia was unveiled in Singapore. Please contact Patty Barnett for more details. 504.524.2922. Please like Barnett Fine Art on Facebook, and follow us on Twitter. This entry was posted on Friday, June 19th, 2015	at 5:15 pm	and is filed under Consignment Services	. Both comments and pings are currently closed.